Alberto Burri (Città di Castello, March 12, 1915 – Nice, February 13, 1995) was an Italian painter and artist. He graduated in medicine in 1940. Actively participated in the Second World War as a medical officer and was taken prisoner of the Allies in Tunisia in 1943 and send in the prison camp of Hereford, Texas. Here he started to paint. He returned to Italy in 1946: he moved to Rome and devoted himself to painting. In 1947 and 1948 held his first solo exhibitions in Rome (Galleria La Margherita). 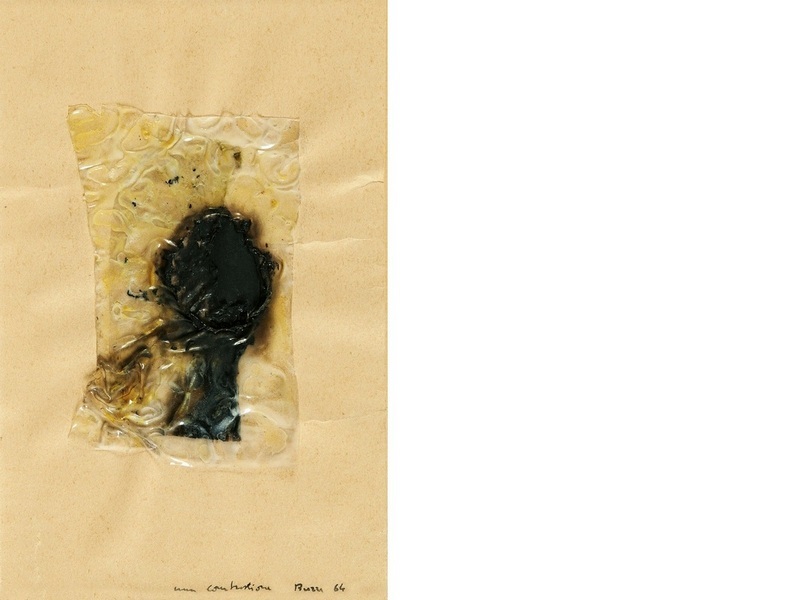 In 1951 he helped to found the group’s “Origin” with Mario Ballocco, Giuseppe Capogrossi and Ettore Colla, and the following year he exhibited at the Galleria dell’Obelisco, the series Neri e Muffe (Blacks and Molds). Since 1950, the Bags are relevant, up to predominate in solo shows that, after Rome, now held in various American and European cities: it is the beginning of an international success. At the turn of the sixth decade, he presents the series of the Woods, the Combustions, and the Irons. At the beginning of the sixties appear the first recapitulations anthologies that, with the new contribution of the series Plastics, will become real historical retrospectives in Darmstadt, Rotterdam, London and Paris (1967-1972). The ’70s showed a progressive depletion of the technical and formal solutions to the monumental, from the Cretti (land and glue) to the Cellotex (compressed for industrial use). Later Burri realizes complex cyclical organisms made of a polyphonic structure. Alberto Burri, artist recognized worldwide, received numerous awards and his work is part of the more prestigious collections.